Would you like all these sound word pictures as a free PDF poster? Click here to get it. We hear different sounds all the time. But how do we actually say them as words? Let’s look at 42 sound words in English (plus some useful idioms with sound words). The sound of something heavy hitting the ground. I don’t know why she’s dropping a brick from a high chair. But it does make a fun sound. The sound of a short, heavy hit. The sound of someone hitting something (or someone) with an open hand. A slap in the face is used when someone has done something bad to you (given you something you don’t want or not given you something that you do want, for example), usually unfairly. A slap-up meal is basically a massive meal — the kind of meal you have when you really don’t want to think about your weight or your health. Just enjoy it! OK, so “knock” is the sound that you make when you arrive at your friend’s house and hit their door with your hand. Stay away! It’s a rattlesnake. And it’s rattling its tail. Think about classic action heroes. They can fall out of planes, jump off the edges of mountains, survive car crashes, helicopter crashes and bike crashes; they can be forced to swim underwater for five minutes and then run 200 metres over burning coals. And after that, they’re just fine, right? That’s because nothing rattles them. Nothing! The sound of something wet hitting something else. Like when you throw eggs or rotten tomatoes at the visiting politician. Or a water balloon at your friend. This is one of those words that sounds like it sounds, if you know what I mean. It’s a heavy, dull sound. This is like clang’s baby brother. It’s a small, sharp sound — usually made when metal or glass touches something. Clang is noisy and unpleasant, right? Now imagine lots of clangs. That’s clatter. The sound of something breaking into a million pieces. Usually violently. We usually use this to describe closing a door very loudly. But we can use it for other similar situations. You can slam the phone down (if you’re using a non-mobile phone, like the retro kid you are). If someone slams the door in your face, they basically decide not to help you or give you information that you need. When I lived in Istanbul, I would play a game. I would try to count to five without hearing a single car honk its horn. I never got past three seconds. Also — it was a terrible game. But I was bored. A continuous sound — usually quiet, often calming. It’s that tiny, short sound. Think about a light switch. Or this annoying guy and his annoying pen. When you click with someone, you immediately get on well. You start talking and it feels as if you’ve always been friends. A loud noise! Usually sudden. This is most closely associated with guns. But the building site next to my house also produces a lot of bangs. If you go out with a bang, you finish or leave something in a super-dramatic way. When someone bangs on about something, they talk for ages about it while successfully boring the life out of whoever has the bad luck to listen to them. The sound of something vibrating. When we talk about the buzz of a place, we’re talking about that special energy it has. Some cities (like Vienna) have a real buzz, while some cities (like Swindon) don’t. You can also buzz someone in when you’re at home, and someone wants to get into the building. It saves you from having to walk all the way downstairs to let them in. This is the sound of a very small bell. Think of a typewriter or a hotel reception desk. A ping will last for a long time (piiiinnnggggg). But a blip is very, very short. Think of a radar in those films with too many submarines in. A blip sounds quite nice, but a beep can get very annoying very quickly. I don’t know how people working as supermarket cashiers don’t go crazy. Do they still hear the beeps when they go to sleep at night? I guess because it’s quite an unpredictable sound, we can also use “snap” as a verb to mean “suddenly get angry.” When you snap, it’s probably a result of lots of things building up. It also has a second meaning. Have you ever tried to talk to someone, and instead of saying “Hi!” or “Good to see you!” or “Nice hair,” they just angrily shout at you — completely unpredictable and sudden? Then they snapped at you. You can also just say “snap” when someone else has something that you have. It could be a plan, an interest, or something physical, like a T-shirt. Finally, there’s a snap election. It’s a general election that the prime minister or president suddenly announces — usually because they think they’ll win. All of a sudden, we’re voting. Again! It’s like a loud snap. If you drink too much of it, you might find EVERYTHING funny and just crack up all the time. It means suddenly start laughing. A lot. Until your face hurts. Fire and fireworks crackle. And not much else. A tiny, little, mini explosion sound. Because it’s such a short sound, we use it in phrasal verbs to describe something quick. The sound of food cooking. There are basically only two things that rustle. Leaves (especially dry, autumn leaves) and paper. To rustle something up means to make a quick meal — like a sandwich or some toast. Or your stomach when you’re really hungry. That nice sound of bubbles popping. Think about sparkling water or champagne. You just need to say this word to understand what it means. Go on, say it. Feels good, doesn’t it? It’s basically the sound of walking in mud. This is the sound of bubbles being created. Imagine lying down in the green grass next to a beautiful stream. The gurgle of the stream of course. And the lion. Look out for the lion. If gurgle is a series of sounds, then glug is a single one of those sounds. Think of how you sound when you’re drinking water quickly. “Drip” looks like “drop,” right? Well, “drip” is the sound that a drop makes when it hits something. The sound of something hitting water (or any liquid). Think of the sound of kids in the bath. Or the sound at the end of a water slide. If you feel like spending a little more money than you should, then you splash out. This is the sound of liquid flowing very slowly. Don’t step on the rat’s tail. He’ll squeal really loudly. Also, it’s not nice. Leave the rat alone, you monster. A squeak is a small, high-pitched sound. Think of the sound of a mouse. Or a door that needs oil. I once had a pair of shoes that squeaked a lot. You can also use the phrase “a squeak out of someone” to describe any sound coming out of their mouth at all. It’s usually used in the negative. Good — you’ve just made a hiss. It’s a bit like a mixture between a hiss and a rustle. When you open that old, heavy wooden door. Or decide to take your kids to a playground that was built in the ‘50s. Then expect to hear a lot of loud, high-pitched sounds of wood and metal rubbing together. The sound of something hard or sharp rubbing against something else. We use this a lot as a verb. You might have to scrape ice off your car on winter mornings. Or scrape the pancake off the pan after you’ve burned it. Or scrape chewing gum off the table. Seriously, why do people do that? We use it when we’ve almost completely run out of options, and all we have are the worst choices. Congratulations! 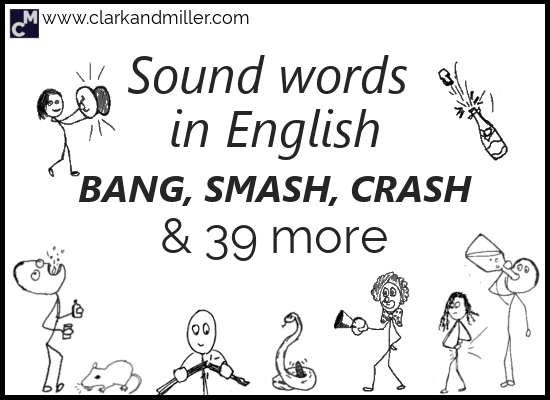 You now know 42 sound words in English (plus some new idioms). Have you splashed out on something recently (like a slap-up meal or clothes)? What ticks you off the most? Can you remember cracking up over something that wasn’t funny? What was it? You have done a lot of good work. I like the little pictures and the examples which make remembering them much easier. I’m not sure I know all these sound words in my mother tongue. Thanks for sharing. Yeah — I was shocked at how many different sound words there are in English. Good job! Your work is well presented and really interesting! Thank you! I really appreciate the positive feedback and enjoy the fact that you’re enjoying the posts!